PORTLAND, Ore. & MIAMI--(BUSINESS WIRE)--Dec. 15, 2016-- Craft Brew Alliance, Inc. (“CBA”) (Nasdaq:BREW) and Wynwood Brewing Company, an award-winning craft brewery based in the heart of Miami’s vibrant Wynwood Art District, announced today their intent to enter a strategic partnership. Through the partnership, Wynwood Brewing Co. would gain access to CBA’s state-of-the-art production capabilities and regional sales and marketing infrastructure, with a focus on meeting increased demand throughout the craft brewer’s home state of Florida. Additionally, under the terms of the partnership agreement, CBA would take a minority 24.5% stake in Wynwood Brewing Co., which will enable the pioneering Miami craft brewery to expand its local production brewery and tap room. 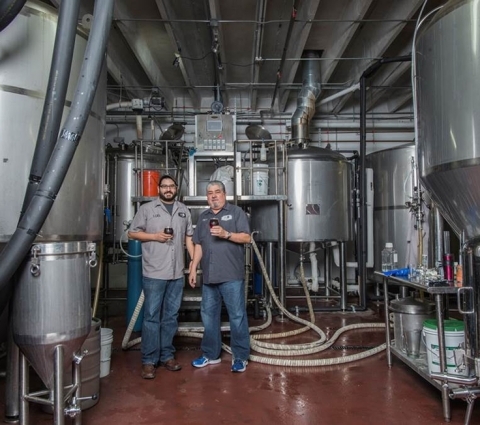 Founded by Luis Brignoni and his father Luis Brignoni Sr. (“Pops”), Wynwood Brewing Co. is deeply rooted in its founders’ Puerto Rican heritage and namesake neighborhood, Wynwood. The neighborhood is renowned as one of the most vibrant and artistic communities in the country and attracts artists and influencers from around the world. The brewery has doubled its production every year since it released its first beers in 2013, drawing inspiration from its location within Miami’s thriving local and international art hub. As Miami’s first craft production brewery, Wynwood Brewing Co. operates a 15-barrel brew house and tap room. The brewery’s core portfolio includes La Rubia Blonde Ale, Wynwood IPA, Magic City Pale Ale, and Pops Porter, which earned a gold medal at the 2014 Great American Beer Festival, along with a rotation of creative seasonal and limited-release beers. Wynwood Brewing Company and Craft Brew Alliance met through the Startup Brewery Challenge, a unique business pitch competition created by Brewbound with the help of CBA and Widmer Brothers Brewing to foster business growth of emerging craft brewers. As a Startup Brewery Challenge winner, Wynwood’s founders and brewmaster traveled to Portland to brew a collaboration beer with CBA’s Innovation Brewing Team, and during that trip it became clear that the Brignonis’ aspirations for their company aligned with CBA’s strategic partnership model. The collaboration beer, known as the Portland Cuddle, won best overall IPA and Gold in the Specialty IPA category at the Copa Cervezas de America, the most important beer competition in Latin America, this past October. Wynwood Brewing Company is CBA’s third partnership forged as part of the company’s strategy to expand the Alliance with distinctive, storied craft breweries in key beer geographies. CBA partners are able to leverage the company’s national brewing footprint and sales and marketing infrastructure, while retaining ownership of their brands and dedicating more resources to support their home markets. CBA and Appalachian Mountain Brewery (AMB) partnered in 2014 to expand theBoone, N.C. brewery across its home state. With the partnership, CBA invested in a canning line at its Portsmouth brewery, which has helped support AMB’s growth from 1,000 barrels to more than 6,000 barrels in less than two years. CBA’s second partnership with Cisco Brewers in 2015 has enabled the Nantucket Island brewery to expand production of its core portfolio in CBA’s Portsmouth brewery and grow volume across their home market of Massachusetts. Wynwood Brewing Company’s mission is simple: To create the best possible brews for their patrons to enjoy. Every day, you can spot someone with spray-paint can in hand ready to create a work of art in the vibrant Wynwood neighborhood. Much like those artists, Wynwood Brewing is committed to creating a work of art in every glass by making great bold beers that have character and are uniquely Wynwood. Their brands take anywhere from 2-6 weeks to be finished. However, they do have some barrel-aged products that take up to 9 months to be completed. WBCo is also committed to creating a strong community by supporting local partners and neighbors, as well as local charities in the neighborhood of Wynwood. For more information, go to http://wynwoodbrewing.com/. CBA is a leading craft brewing company that brews, brands and markets some of the world’s most respected and best-loved American craft beers. We are home to three of the earliest pioneers in craft beer: Redhook Ale Brewery, Washington’s largest craft brewery founded in 1981; Widmer Brothers Brewing, Oregon’s largest craft brewery founded in 1984; and Kona Brewing Company, Hawaii’s oldest and largest craft brewery founded in 1994. As part of Craft Brew Alliance, these craft brewing legends have expanded their reach across the U.S. and approximately 30 international markets.